January and February are generally regarded as quiet months in the garden. 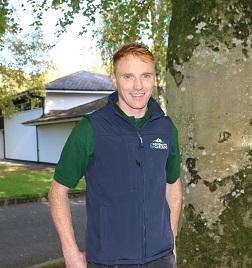 However, The Irish National Stud & Gardens is currently alive with excitement ahead of reopening on February 11th for the 2019 season. Work is at a full here in the gardens as Japanese Maples have been expertly pruned by Jim our Japanese Garden maintenance expert. The red buds of our famous Maples are getting bigger by the day and giving us a glimpse of the colours to come. Winter has been extremely mild this year. This has given way to intense growth to the pond weed in our front pond. 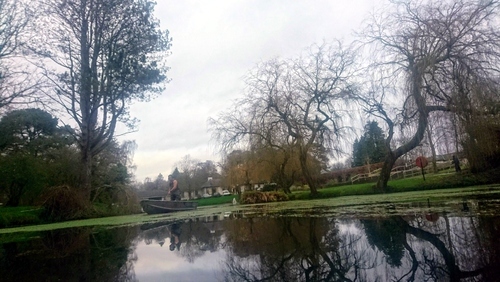 Peter has been hard at work physically removing the pond weed in a naturally friendly way. Spring has burst into life in St Fiachra’s Garden, David has noticed that growth is roughly four weeks ahead of the usual time. Bluebells pushing up their leafy growth, Snowdrops amass with colour and Daffodils giving that Spring feel. A stroll through the INS Gardens in the Spring is a joy not only for our tourists and staff but also for our endless amount of wildlife which is attracted to the garden. Swans in the pond, Trout spawning in the streams and birds enjoying the berries of our Hawthorn, Cotoneaster and Mountain Ash trees. Pruning has commenced on our Scots Pine at the visitor’s entrance in order to prolong the life of the famously angled tree. 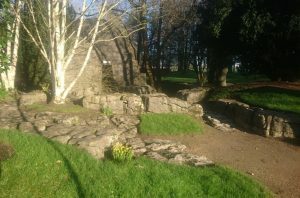 The rockery underneath has been redesigned for ease of access. 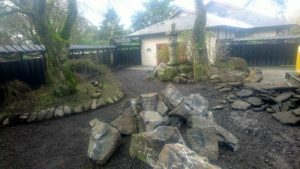 Limestone boulder rocks have been hand chosen and carefully placed around the rockery to tie in with the authentic features of the Japanese Gardens. Numerous exciting projects have been completed by the garden and maintenance team ahead of the busy 2019 season. Looking forward to meeting new and returning visitors.